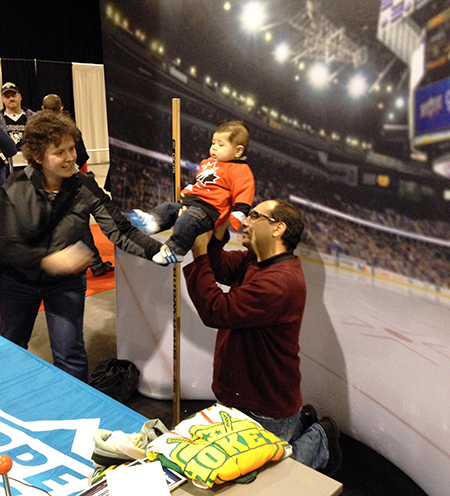 Upper Deck is Bringing in the New Year with a Variety of NHL® Activations! Fans that have been collecting 2016-17 Upper Deck NHL® trading cards this season have enjoyed the value they are seeing in this strong rookie class. 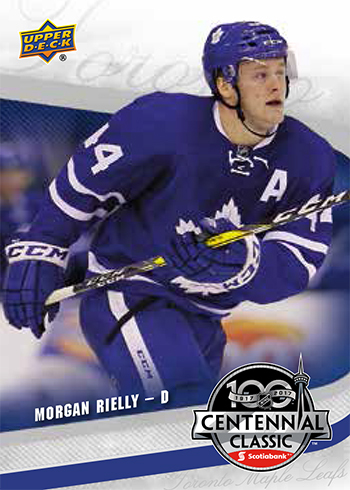 With standout rookie players on key Canadian franchises, it’s a great time to be a collector. Upper Deck plans to celebrate not only this season, but all 100 seasons of the NHL®’s existence with a variety of activations starting this weekend. Upper Deck will have a booth at The Pregame for the 2017 Bridgestone NHL Winter Classic® in St. Louis with a professional photographer on site to produce trading cards for fans on site! Have you always dreamed of being on an Upper Deck trading card? Now is your chance! Upper Deck will also have a booth at the 2017 Scotiabank NHL Centennial Classic™ Fan Arena with Tim Hortons® in Toronto. The trading card giant will have two personalized trading card stations at this event to accommodate the passionate Toronto Maple Leaf and Detroit Red Wings fan bases. Fans at the Centennial and Winter Classic games will also see first-hand the Upper Deck e-Pack™ platform at these events! 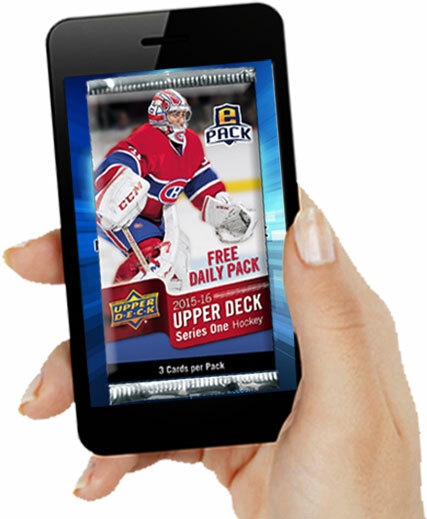 Hockey fans can now open NHL® packs anytime, anywhere, even from an outdoor hockey game! From there you can trade them with other collectors around the world, or even have physical versions of the cards shipped to you for a nominal fee! Make sure to check it out at www. UpperDeckePack.com! Get in the game with Upper Deck by getting your very own trading card at these two great events. Plan on arriving early though, this free promotion is one of the most popular and the lines can get quite long! 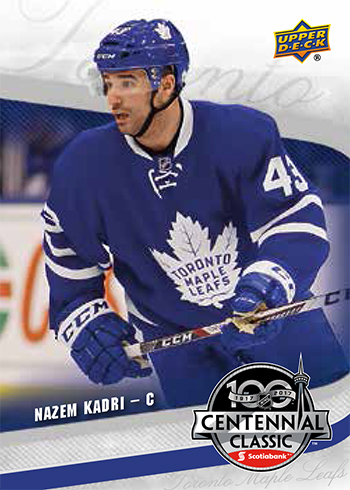 Fans in Toronto are going to be spoiled in January as Upper Deck has produced a special 6-card 2017 Scotiabank NHL Centennial Classic promotional set that will only be available at hobby shops in the area with a $20 purchase. 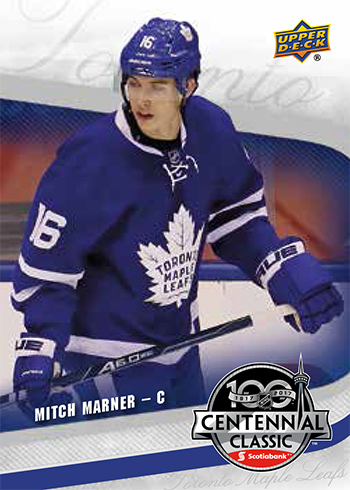 A special bonus Card 0 of Mitch Marner can be had if you purchase a hobby box of 2016-17 Upper Deck NHL® cards. These sets will begin arriving in stores next week, so make sure to ask your Toronto based shop if they will be receiving these limited-edition packs! Upper Deck will be additional plans for NHL® events in the coming weeks!